Last week, the DRL team hosted a workshop to bring together the perspectives of the different researchers who worked on different facets of the Ebola response. Although we have different backgrounds, ranging from modeling and optimisation to ethnographic approaches, our observations were strikingly similar. The use of technology often dominated the discourse. Reporting, mapping, or data collection became a purpose, instead of being an enabler. Coordination and project management structures were constantly shifting and adapting to the changing needs, or because it was clear that the current solution was not good enough. In the fight against Ebola, the adaptation of processes and procedures became a race to follow the disease - constantly changing and shifting. In the next weeks, we will aim to complement our experiences in the field with scientific analyses from our respective disciplines. Instead of presenting the results from our individual approaches in a collection or portfolio of results, we will aim at developing an integrated methodology, in which results from management, decision theory, cognition, modeling, and ethnography enforce and strengthen each other. Our aim and ambition is to gain a deeper understanding of the mechanisms that have been driving the response to Ebola, and to develop solutions that can help both researchers and humanitarian responders to learn from each other. Yesterday, on December 29th, Jonas Landgren joined the Swedish MSB team to conduct field research on their operations in Liberia. Starting in Monrovia, and later moving to the MSB-run Ebola Treatment Unit in Greenville, Jonas' work aims at understanding how to further advance technology use in the field. The work of synthesizing fragmented information and transform it into meaningful reports, describing critical aspects of ongoing operations is widely perceived as time-consuming, difficult, and frustrating. The response to Ebola is no exception: data collection and reporting are often done under time pressure, as a part of a dynamic organizational processes, and with limited technology support. Reporting that ideally should support decision making and improve coordination, creates friction in and between organizations and is often perceived as drawing resources and attention away from the real work. For initial findings from Accra on these topics, see our initial brief. To find out more about the challenges of reporting, Jonas will conduct observational research to study team leaders, information managers and coordinators in their local work settings with specific attention to the situated use of information technologies. Tina and Bartel, the Ghana DRL field team, have spent a week at the Ebola Coordination Hub in Accra. 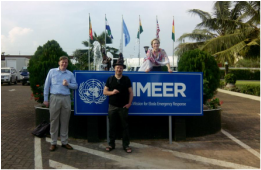 They had the opportunity to discuss with people working in the UNMEER (United Nations Mission for Ebola Emergency Response) regional Head Quarters. ﻿UNMEER﻿ has been created for the purpose of fighting Ebola in September 2014. Under the umbrella of UNMEER several UN agencies work together to fight Ebola such as WHO, WFP and UNICEF. Other players are not involved in UNMEER, most notably OCHA, the office for coordination of humanitarian affairs. In several discussions, we have been exploring the emerging coordination structures between the UNMEER HQ and the field. The team also visited the UNHRD warehouse, and interviewed people from WFP as well as humanitarian NGOs like NetHope, MapAction, and the Germany Support Team that is reinforcing the logistic operations. In the back office, Laura Laguna has been working on identification of contacts and helping with arrangement for interviews with responders who would like to support our work by sharing their experience in the field, including NGOs and other organizations. Laura has also run some spot analyses on the first interviews and provided feedback to the field team. Some impressions from an initial analysis confirm that coordination of the response under UNMEER is highly complex, as people from different organizations with their respective working cultures; processes and procedures must now work together. Getting reliable data from the field is still difficult, and many efforts are undertaken currently to improve Information Management. In the coming weeks, 60 new Information Management Officers will be sent to the field and cover all districts in the three affected countries of Sierra Leone, Guinea and Liberia. Despite these challenges, the team is impressed by everyone’s dedication and commitment to fight Ebola. Tina and Bartel are leaving this Sunday, December7th 2014, to Accra, Ghana, where the UNMEER headquarters are based, a major hub for coordinating Ebola operations in the West African sub-regionare is stablished. 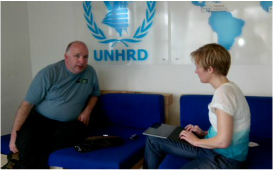 Additionally, WFP hosts one of the United Nations Humanitarian Response Depots (UNHRD) in Accra. Equipped with massive amounts of sanitizer, the DRL team will to spend one week in the country, to meet practitionners from different relief organizations and UN agencies, and start the field exploration, which we will continue to the affected countries in January and February 2015. Jonas Landgren, Matthieu Lauras and Laura Laguna will support the field team work remotely. Laura will also continue to update this blog and keep you posted as we go. Which information helps making better decisions? At the same time, Bartel organized a "Stop Ebola" Event with his Students at Tilburg University - to raise awareness and discuss what all of us can contribute. We are happy to announce that the Ebola research team is about to embark to a first exploratory trip to Accra, Ghana from December 7th to December 15th. The field team will consist of Bartel and Tina. Jonas Landgren, Matthieu Lauras and Laura Laguna will support our work remotely. An overview about the team members is available under People.